The second season of the Metropolitan division is rife with change. Carolina, Washington and Pittsburgh have new coaches, Washington beefed up their blue line and the Rangers had no choice but to buy out Brad Richards. Last season, the Penguins all but dominated the division. I think they’ll have a more difficult time within the division this year in part due to goalie changes. For that reason I’d like to take a look at the goalies of the Metro. 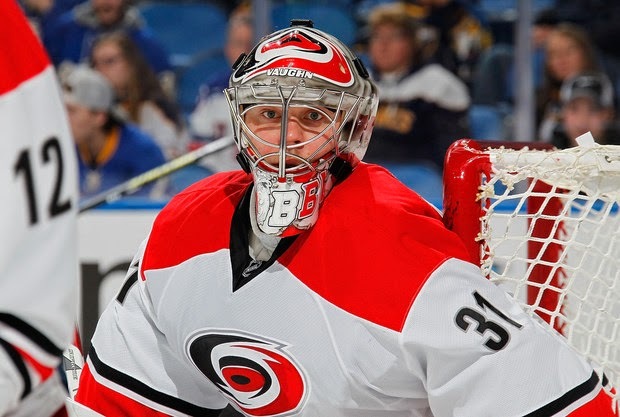 Hurricanes: For 10 seasons, Cam Ward has been a fixture in net for the Carolina hurricanes. This summer he got a call from GM Ron Frances letting him know that the team was looking for trade options. The previous Conn Smythe Trophy winner thought his days in Carolina were over. Anton Khudobin had taken over the starting position last spring after Ward went down with a groin injury. Ward finished the season with 10 wins, a 3.06 goals-against average and .898 save percentage in 30 games. Khudobin by contrast finished fifth in the League with a .926 save percentage. "Because of the injuries, I have played out of fear that I was going to get hurt again," Ward said. "It's a very difficult position to play when you don't have confidence. I have battled that the last couple years." When he gets past the injuries in his head, he’ll have to reconcile that he remains in Carolina because the team was unable to shop him for a decent return. Canes coach Bill Peters has taken the “Let them compete” attitude toward the two goalies as the team heads to camp. According to Peters,” Everyone's going to have an equal opportunity to show how good they are and how ready they are to start the year on time." I give the advantage to Khudobin. Blue Jackets: Columbus head coach, Todd Richards is not shy in saying that Sergei Bobrovsky is the backbone of the Blue Jackets. 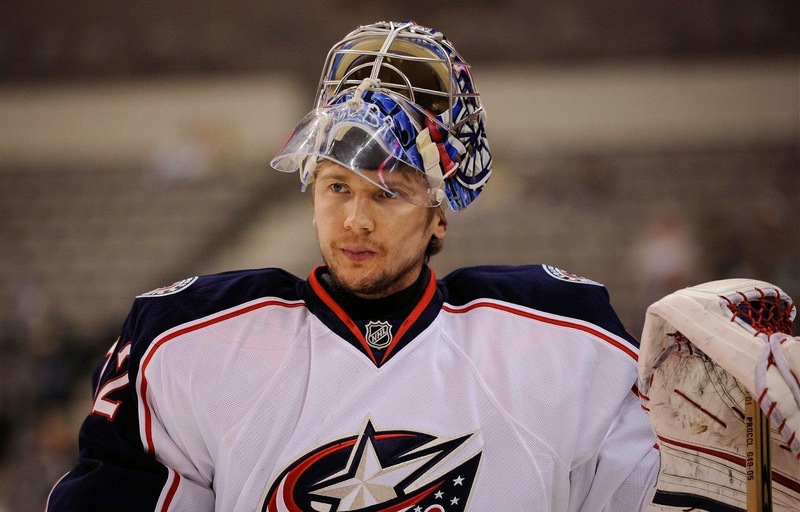 Going into his 3rd season w Columbus 2013 Vezina trophy winner Bobrovsky will be the man in net. After previously suffering through goalie hell in Philadelphia, “Bob” is beloved in the heart of Ohio. In two years with the Blue Jackets, the 25 yr old has posted elite numbers: 53-31-11 with nine shutouts (the first nine of his NHL career), a 2.19 goals-against average and - the most indicative goaltending stat - a .927 save percentage. It appears he will be backed up by 31 yr old Curtis McElhinney who brings career stats of 29-37-5 and ,902 sv%. 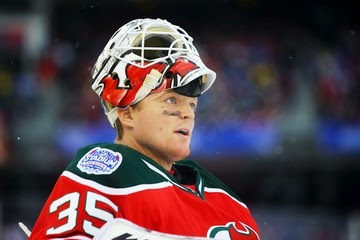 Devils: For his entire NHL career, goal tending in New Jersey has been synonymous with Martin Brodeur. In his 21-year tenure with the Devils, he won three Stanley Cup championships and has been in the playoffs every year but three. The future hall of famer, however, is testing the waters of free agency at the age of 42. After splitting time in net last season with Brodeur, 28 yr old Cory Schneider signed a 7 year, $42 million deal with the Devils in the off season. Interestingly, Schneider tales the helm having never played more than 45 games in a season. He has spent the first six years of his career backing up two great goaltenders in Robert Luongo and Brodeur and has yet to prove if he can be successful as the workhorse goalie in a long season. In the 45 games played, he posted a 16-15-12 record, a .921 save percentage, and was third in the NHL with an outstanding 1.97 goals against average. Schneider is a smooth, fluid goalie in net. This could easily be a break out season for him. His biggest challenge moving forward with the Devils may very well be living with the ghost of Martin Brodeur. Keith Kinkaid is projected to be the backup goaltender. The Devils have signed Scott Clemmensen to a one-year, two-way contract as 'insurance'. Islanders: Garth Snow was so despirate to improve his dismal goalie situation that he didn’t even wait for free agency to upgrade. Snow went out and acquired Jaroslav Halak's rights two months before the free agency period began, and had Halak's signiture on a new 4 year deal three weeks later. Halak played the first half of last season with the St. Louis Blues (40-24-9) and the last part with the Washington Capitals (12-5-4). His combined save percentage was .921. 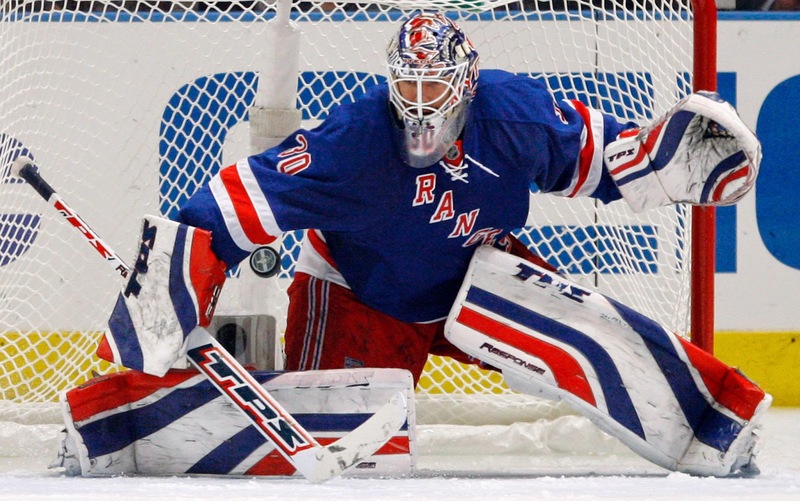 Also 28 yrs old, he has played 272 career games with Montreal, St. Louis and Washington notching 30 career shutouts. Chad Johnson will back Halak up. The 28 yr old backed up Tuukka Rask in Boston last season with an impressive 17-4-3 record, 2.10 goals against average and .925 save percentage. 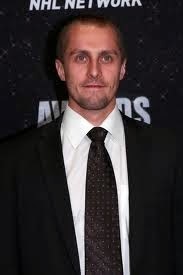 Rangers: Henrik Lunqvist will be in goal for the Rangers and he will be good. There isn’t much else to say about the 32 yr old Vezina trophy winner. He is the only goaltender in NHL history to record 30 wins in each of his first seven seasons. He has been strong in net for the Rangers since 2005 and reached the Stanley Cup Final last season after going 33-24-5 during the regular season with a 2.36 goals-against average and .920 save percentage. 27 yr old Cam Talbot is the front runner to back up Lundqvist. Flyers: The Philadephia Flyers are notorious for mediocre goaltending. 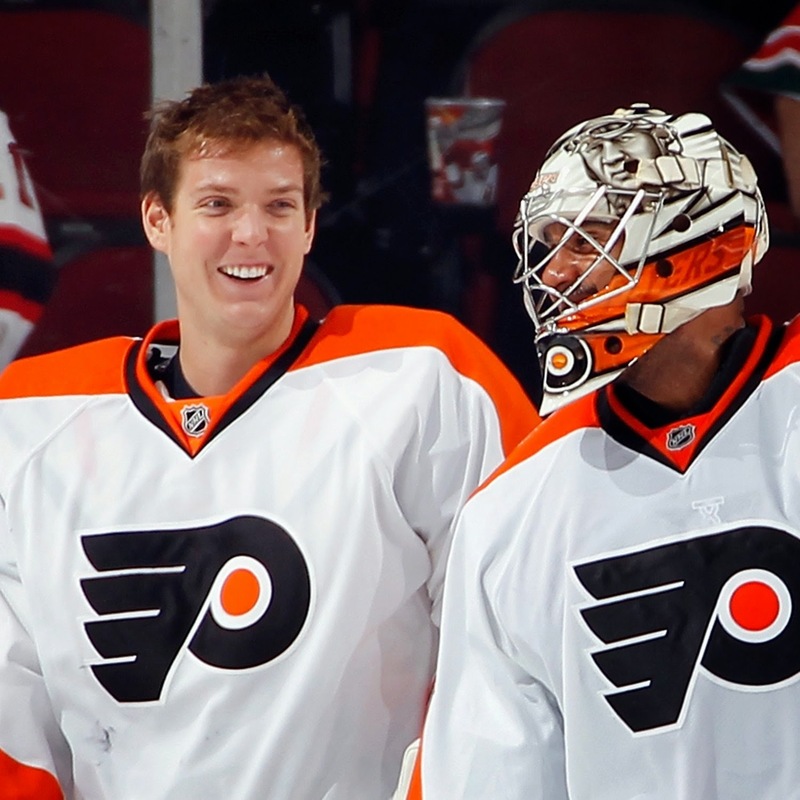 Last season they gave net time to both Steve Mason and Ray Emery. That worked so well that it appears they will do it again this season. Last year Mason sort of resurrected his career. He finished seventh in the NHL with 33 wins, while posting a 2.50 GAA (25th) and .917 SV% (21st). Ray emery (21-9-12), by contrast, skated up the ice and fought Braden Holtby who repeatedly said he didn’t want to fight him. Mason should be the clear number one over Emery. 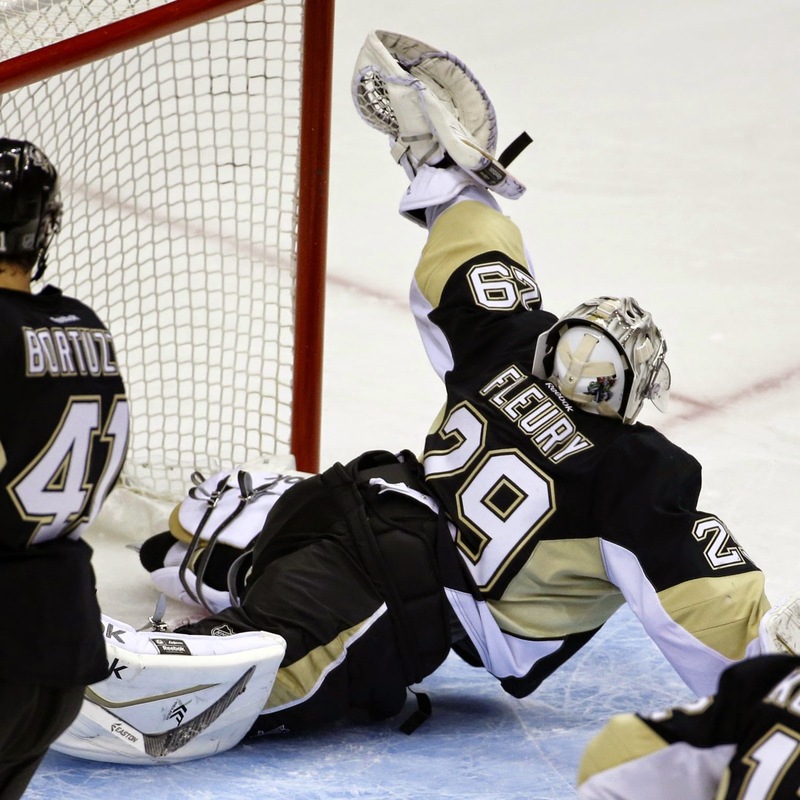 Penguins: Marc Andre Fleury is the goalie everyone loves to hate. The 29 yr old has played his entire NHL career with Pittsburgh and led them to a Stanley Cup win in 2009. His career has been marred by lapses in confidence. Fleury famously sought the help of a sports psychologist after his poor performance in the 2012-13 post season. He finished the 2013-14 season 64-39-16 with a .915 save% but when the Penguins lost to the Rangers in the Eastern Conference semifinals fans doubted Fleury all over again. Sweeping changes in the Penguin’s organization followed. Instead of extending Fleury’s contract this off season, Penguin GM Jim Rutherford has indicated it was “not an immediate priority” to re-sign the net minder. He is heading into the last year of a seven yr $35 million deal. Jeff Zatkoff, who was pressed into duty as backup goalie after Tomas Vokoun’s blood clot last season, will compete with Thomas Greiss for that position. At 28, Greiss is only one year older than Zatkoff, but Greiss has played more than three times as many NHL games. Capitals: Braden Holtby had the lowest save percentage and goals-against average of his brief NHL career last season yet management of the Washington Capitals have reassured him that he’s their man. He will start the season in the comfortable #1 position despite his GAA of 2.85 and save % .915 for 45 starts. 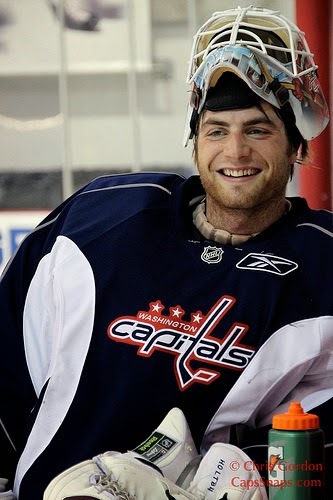 Holty is excited to play under Barry Trotz and new goalie coach Mitch Korn who uses many of the techniques Holtby was used to Saskatoon like white pucks and visualization techniques. Free agent acquisition Justin Peters is slotted to play backup. It isn't easy being a goalie in the NHL. Being a goaltender means lots of responsibility, some pressure, and the need for "tough skin." A good goaltender can make up for a flawed team but a good team can only get so far with a flawed goalie. The Metro division has proven journeymen as well as net minders looking for a break put season. I hope this review helps you appreciate each of them a little more.